Bob Hope&apos;s jokes might have gotten a little stale by the 1970s--but not his taste in architecture. 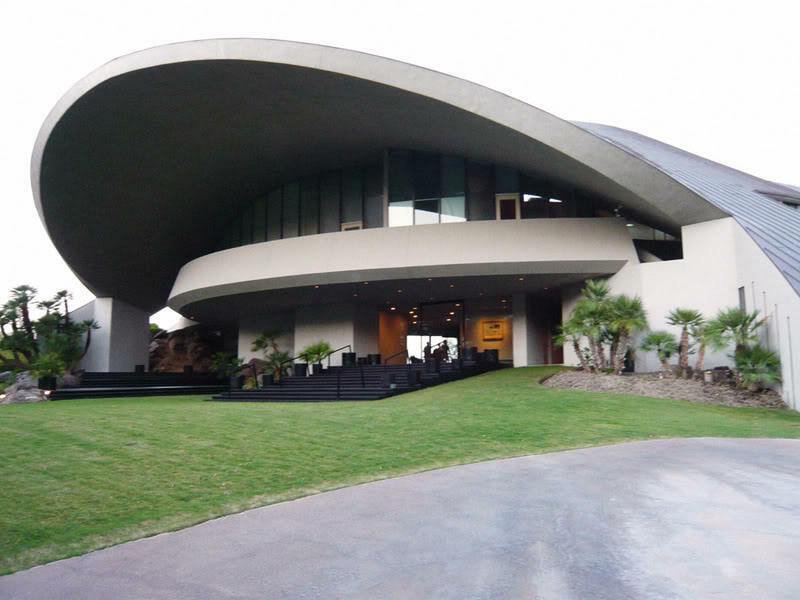 In the early 1970s, the legendary comedian who got his big break in the 1920s at the old Stratford Theater at 63rd and Halsted hired famed architect John Lautner to design a modern and quite expansive six-bedroom home in Palm Springs, CA. The house&apos;s backstory is more befitting a drama than a comedy. Lautner reportedly fell out with Hope and his wife Dolores over the couple&apos;s changes to his design. And unrelated to the contretemps, the place burned down in 1973 while under construction. Now that all history--and the house--can be yours for $50 million. Hope&apos;s daughter, Linda, told the New York Times this week the home was a second residence for the couple and was frequently used for entertaining, sometimes as many as 300 guests at once. "She absolutely adored the place," Linda Hope said of her mother. "My dad did, too." Built for $3 million, the hilltop house is all curves, particularly its mushroom-like roof that has a huge oculus for a light shaft at its center. And although Palm Springs has an eye-popping collection of top-notch midcentury architecture, the Hope&apos;s 23,000 square foot joint stood apart. Even Hope himself joked the house&apos;s size. "When it is finished, it will make Bing Crosby&apos;s house look like an outdoor privy," he said in a June 1973 Associated Press story. "That house will be so big, you could hold next year&apos;s Super Bowl game in it." The home caught fire a month after Hope made those quips. The blaze was large enough to draw spectators and the entire Palm Springs fire department. The home was rebuilt in 1979. Hope died in 1993 at age 100. His wife Dolores died at 102 in 2011. Lautner died in 1994 at age 83. A $50 million price tag is steep, though, even for Palm Springs. Actor William Holden&apos;s nearby modernist house was on the market for $4.4 million in 2011, but is "only" 8,000 square feet. You can see more images of the Hope house here at Haute Living. You&apos;ll also see the house&apos;s original projected asking price was $45 million last November. He who hesitates, I suppose.